So it happened. That moment I didn’t realise I’d been dreading. The GP gave me the all clear to return to exercise, yes that’s a green light for full cardio and resistance training. Up until now I have been living in a “I’m not supposed to” protective bubble. Generally speaking since my c-section I have been active, initially doing more than I should have and then plateauing. However, the “active” post-op me is a complete couch potato compared with my pre-pregnancy self. Until this moment I had been comforted by encouraging comments such as “you are doing too much” and “take it easy”, essentially allowing me to sit back and eat cake (albeit chocolate coated rice cakes) and tell myself I was being healthy. Then came the permission to go forth and sweat, to tell you the truth the thought terrified me. So I did the only thing I could think of. I contacted a close friend and asked her to join me in an exercise DVD- a total wimp manoeuvre on my part because a) If I’m honest, I actually hoped I would meet with her on the pretence of exercise, but inevitably get distracted by tea and perhaps the afformentioned rice cakes (they are ridiculously good-see link below) and B) because I thought, should we get as far as actual exercise, I knew that my dear friend would not only motivate me, but she also wouldn’t mock as she bear witness to the sweat puddle that I was likely to become after such prolonged abstinence! This plan of mine backfired. BIG time. Said friend was feeling super keen. Before I knew it, I’d signed up to a kettle bell class!? To say our exercise date escalated quickly is an understatement. This in part was due to a lack of availability at other more mainstream (and far less terrifying) classes and confounded by my eagerness to avoid anything “dance” based (I severely lack co-ordination to the extent that if put in an organised dance situation I should be pointed out as a health hazard during the fire exits and toilets are located here talk). So that was it. We were attending a Kettle bell class. And. It. Was. Epic. My plan of arrive early, get a spot at the back and pick the lightest weight was partially executed. Unfortunately the instructor recognised my rabbit in headlight expression and then spent the entire session “checking in”. To add insult to injury, the lightest available weight was 4kg… I told myself that I lift babies that weigh this much. The thing is I don’t tend to squat, dip and lunge with my babies in tow. Maybe I should start? Save myself the £5:60 class fee. This class brought me the kind of pain that you know means you’re getting an effective workout. A kind of pain that I know will be with me for at least 3 days and I expect it will get worse before it gets better. A perversely addictive kind of pain that saw me considering signing up for the next session on my way out (probably because my electrolytes were so deranged from sweating I am no longer capable of lucid thought!). Clearly exercise is about fitness and health, not weight-loss. But, it’s worth knowing that Shape Magazine estimate the average person will burn 20 calories a MINUTE when using Kettle Bells. That means I could eat 16 CHOCOLATE rice cakes during the 45 minute class and still burn 20 calories- what’s not to love?! 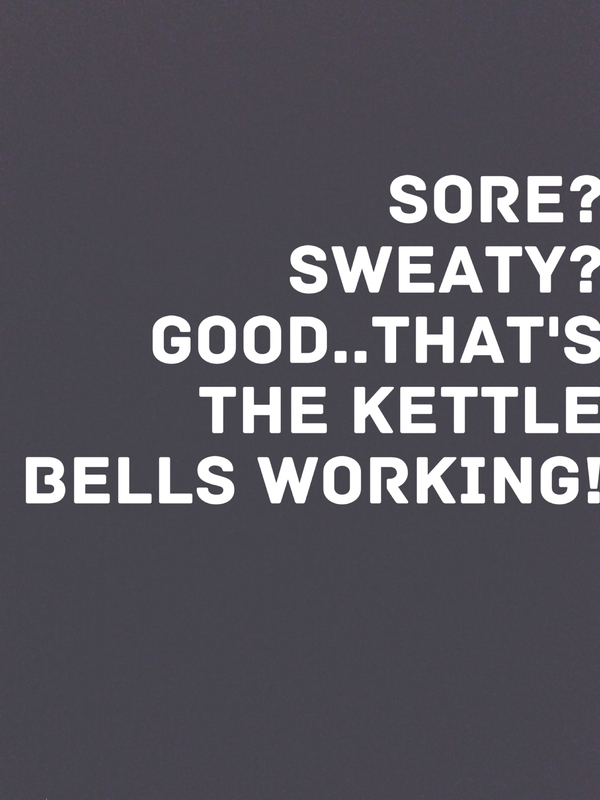 Whilst fantastically simple and effective, kettle bells are not without their pitfalls. (Disclaimer alert #1) Improper use can result in injury…so you can’t just pick ’em up and swing willy nilly! It is recommended that if new to using them you start with a low weight and seek professional instruction. I reserve the right to edit this post as I am writing it off the post exercise endorphin rush and the lactic acid sitting in my muscles has not yet festered to a point of maturity and rendered me bitter.